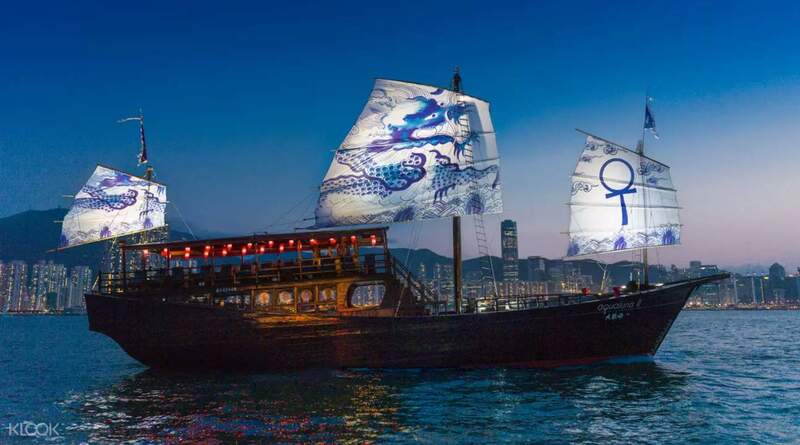 Check out the other AquaLuna activities on Klook: AquaLuna Harbor Day Tour, AquaLuna Stanley Cruise, Aqualuna Dim Sum Cruise and AquaLuna Symphony of Lights Cruise! We took the 630 pm sailing. Go early and choose the pier 1 boarding so you can get the best seats. A very good experience and klook purchase a swell! Appreciate Hong Kong's magnificent harbor views aboard one of the city's last remaining traditional red-sail Chinese junks! Relax in style on a comfy lounge bed, enjoy a complimentary drink and soak up the sights and sounds of Hong Kong's fantastic night scene. 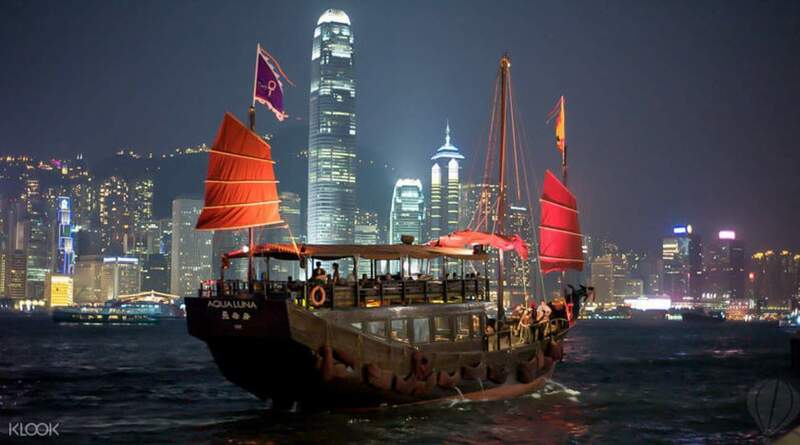 The Aqualuna Evening Sail cruises you across the Victoria Harbour, taking in the skyline over a complimentary cocktail. Choose to cruise just as the sun is setting or wait until the fall of darkness when the city lights glimmer across the water. This is indeed a must for HK tourist because the ship is very unique, exclusive and beautiful. The TST pier is also very easy to find. The staff there is very helpful and polite compared to other HK person that I meet. They even give us to get to the front queue although the line was already long.They even help us to take our family photos. Maybe in the future could collect the glass drinks a little earlier rather than for us to hold it quite long although we have finish it.Maybe the crew could arrange a photo session for each family because it is quite hard to take it our ownselves while sailing and we are not stable. This is indeed a must for HK tourist because the ship is very unique, exclusive and beautiful. The TST pier is also very easy to find. The staff there is very helpful and polite compared to other HK person that I meet. They even give us to get to the front queue although the line was already long.They even help us to take our family photos. Maybe in the future could collect the glass drinks a little earlier rather than for us to hold it quite long although we have finish it.Maybe the crew could arrange a photo session for each family because it is quite hard to take it our ownselves while sailing and we are not stable. The experience was super great. It brought me back to my childhood memories. The rides and games stall were super cool. One thing I didn't like was that you have to use tokens to buy food, which was super duper expensive. But overall the experience was still the same a much loved one. It's good to anyone who wanted to experience the joy of being a child . I would definitely come back again and highly recommend to others as well. The experience was super great. It brought me back to my childhood memories. The rides and games stall were super cool. One thing I didn't like was that you have to use tokens to buy food, which was super duper expensive. But overall the experience was still the same a much loved one. It's good to anyone who wanted to experience the joy of being a child . I would definitely come back again and highly recommend to others as well. Great experience to unwind and chill while looking at Hong Kong’s amazing skyline. Plus points for the welcome drinks of your choice (wine/beer/juice). 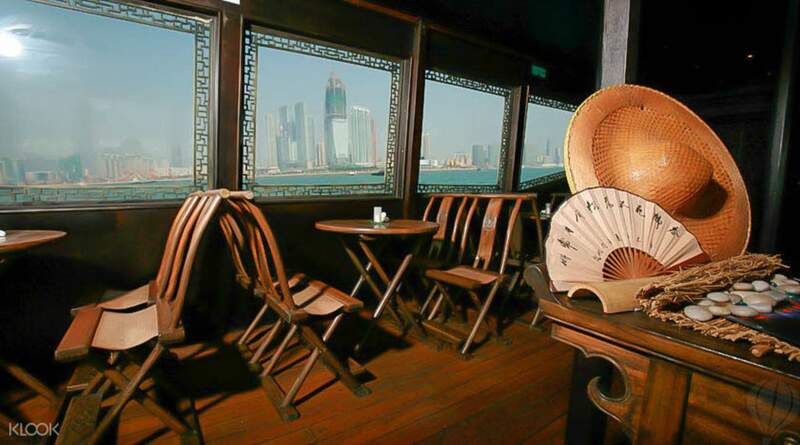 Tip: book the 5:30pm sail (kowloon) for 2 amazing views. Great experience to unwind and chill while looking at Hong Kong’s amazing skyline. Plus points for the welcome drinks of your choice (wine/beer/juice). 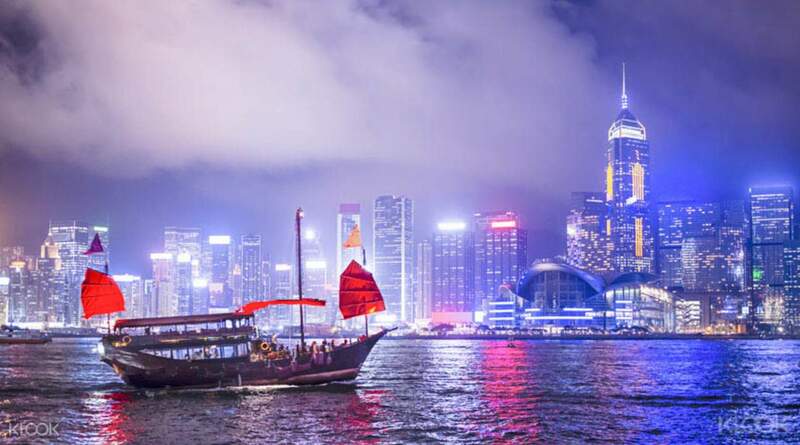 Tip: book the 5:30pm sail (kowloon) for 2 amazing views. Amazing weather! Complimentary drink was wine, beer, juice or soft drink. the views were rather nice. it was overcast so we didn't get to see the sunset but the transition from day to night and see the buildings come to life at night was amazing. a good nice was to relax through the sail. there's no physical counter for redemption but once you see the aqualuna boat, you should be safe. if you have difficulty finding pier 9, just find the big Ferris wheel! Amazing weather! Complimentary drink was wine, beer, juice or soft drink. the views were rather nice. it was overcast so we didn't get to see the sunset but the transition from day to night and see the buildings come to life at night was amazing. a good nice was to relax through the sail. there's no physical counter for redemption but once you see the aqualuna boat, you should be safe. if you have difficulty finding pier 9, just find the big Ferris wheel! Reached about 30 mins before sailing and there was already a queue. Redemption was easy and just had to show the staff the booking. Boarding was efficient and managed to get comfy lounge seats as we came early. The 5.30 timing is great if you want to see the transition to night time. Drinks were drinkable but don't expect too much. Otherwise, service was great and staff was attentive. Back on land by 6.30 and grabbed some small bites from the food trucks nearby before catching the Symphony of Lights show at 8pm. Reached about 30 mins before sailing and there was already a queue. Redemption was easy and just had to show the staff the booking. Boarding was efficient and managed to get comfy lounge seats as we came early. The 5.30 timing is great if you want to see the transition to night time. Drinks were drinkable but don't expect too much. Otherwise, service was great and staff was attentive. Back on land by 6.30 and grabbed some small bites from the food trucks nearby before catching the Symphony of Lights show at 8pm. The perfect way to spend the evening! It was such a wonderful experience that we all joked about stowing away on the AquaLuna or booking more tickets so we'd never have to leave. All joking aside though, we did walk away talking about how we look forward to sailing on the AquaLuna again the next time we come to Hong Kong. The perfect way to spend the evening! It was such a wonderful experience that we all joked about stowing away on the AquaLuna or booking more tickets so we'd never have to leave. All joking aside though, we did walk away talking about how we look forward to sailing on the AquaLuna again the next time we come to Hong Kong. Once u reach pier 1, there's a guy waiting. Just show him the booking. There's an extra 60 HKD to pay when board. Probably for the beverages which compulsory. The ride was an hour plus. This ride is a must when visit Hong Kong. Truly hongkong experience. You might get sea sick if you not used to boat ride. Once u reach pier 1, there's a guy waiting. Just show him the booking. There's an extra 60 HKD to pay when board. Probably for the beverages which compulsory. The ride was an hour plus. This ride is a must when visit Hong Kong. Truly hongkong experience. You might get sea sick if you not used to boat ride. Best experience so far, for me and my boyfriend. It is very relaxing and you will get to see the city lights in a great seat during the evening sail. It was on time, and to select a seat, fall in line 30 minutes earlier than the schedule. Best experience so far, for me and my boyfriend. It is very relaxing and you will get to see the city lights in a great seat during the evening sail. It was on time, and to select a seat, fall in line 30 minutes earlier than the schedule. No regrets!! Klook is very amazing and less expensive! hassle free.. we feel relax and comfortable. we was planning to take all our tickets from klook in our next trip in other country.we hope its the same.my only problem with klook i cant change the sched we was booked. if you are trying to booked in klook be sure you'll be there on time so that your mloney wont be wasted. No regrets!! Klook is very amazing and less expensive! hassle free.. we feel relax and comfortable. we was planning to take all our tickets from klook in our next trip in other country.we hope its the same.my only problem with klook i cant change the sched we was booked. if you are trying to booked in klook be sure you'll be there on time so that your mloney wont be wasted.